Though the United States continues to urbanize, some residents choose a quieter locale to live and work, including Citizen Potawatomi tribal member Amy Sunday. She currently lives in the small city of Holton, Kansas, near her hometown of Netawaka. The Martin family descendant graduated from Jackson Heights High School outside Holton before getting a degree in veterinary medicine at Kansas State University. 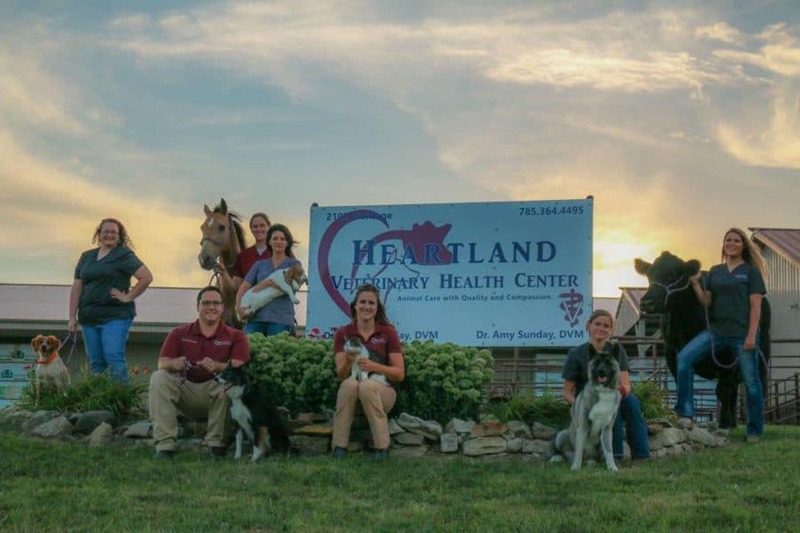 The Hownikan recently spoke with Dr. Sunday, owner of Heartland Veterinary Health Center, about her background, career and decision to work in a rural setting. Dr. Amy Sunday (center, holding a cat) runs the Heartland Veterinary Health Center with her husband and co-owner, Dr. Don Sunday. Why did you decide to pursue an education in veterinary medicine at Kansas State? While you manage the medicinal and surgical cases on an individual basis, you also focus on herd health. What does a veterinarian do in that specific area? You returned to your hometown area to provide veterinary services. Why did you feel the need to return there as opposed to heading to a bigger city? “I have always enjoyed the small-town vibe. There is something unique about knowing your neighbors and being able to say hi to each other at the grocery store, at dinner or feeling safe letting your kids walk to school. I also am very close to my family, so being able to see them on a regular basis is a great bonus. What are the components of managing those responsibilities and running the business side of things? What are your favorite animals to treat, in terms of either the biggest challenge or the reactions you get from their owners? “My favorite animals to work with are felines. I have also been a cat lover, so I feel like I understand them more than most individuals. I enjoy them so much that I pursued the added effort to make my practice a certified Cat Friendly Practice through the American Association of Feline Practitioners. To learn more about Dr. Amy Sunday and her practice at Heartland Veterinary Health Center, please visit heartlandvetholton.com.